Behind the Gate 5 out of 5 based on 3 ratings. 3 user reviews. 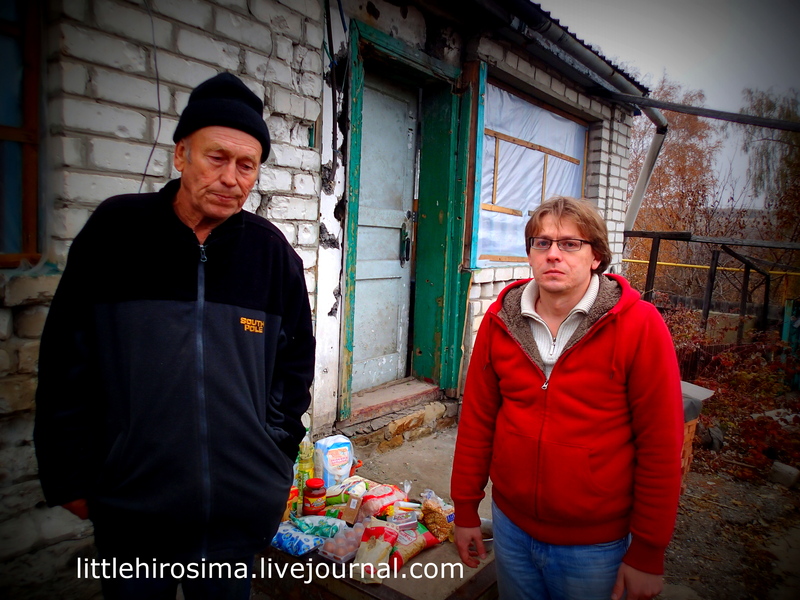 In almost a year of visits to the Donbass, this is one of the most horrifying stories which I encountered. There were other no less tragic stories. But there’s something particularly sad about this one. Perhaps it’s because Viktor tells it so coolly, so detachedly. We stood there with our silly food packets and didn’t know what to say. This is Viktor Rusanov. 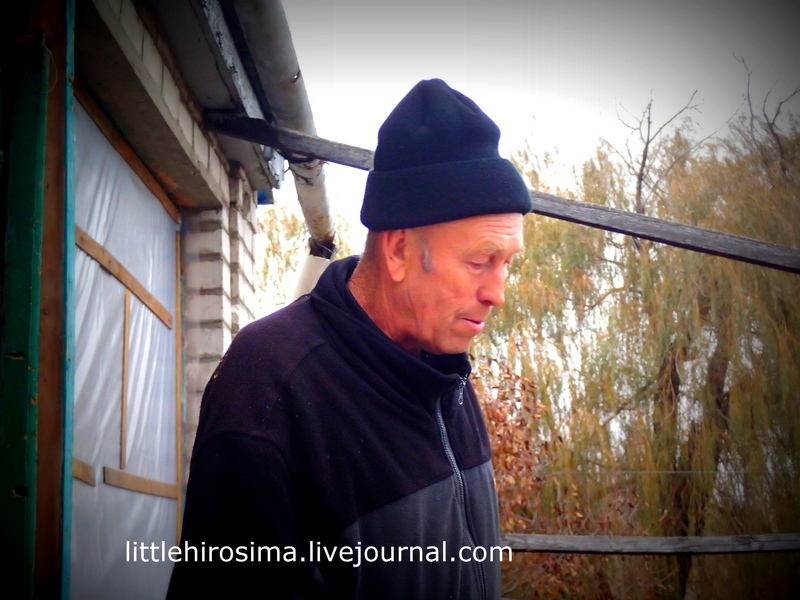 He lives in Pervomaysk, in the vicinity of Zelenkhoz. -On November 15, around 7 o’clock, I went outside my front gate and suddenly heard two bangs. They turned everything inside out. The shack, all the additions, the garden, knocked down roof tiles. 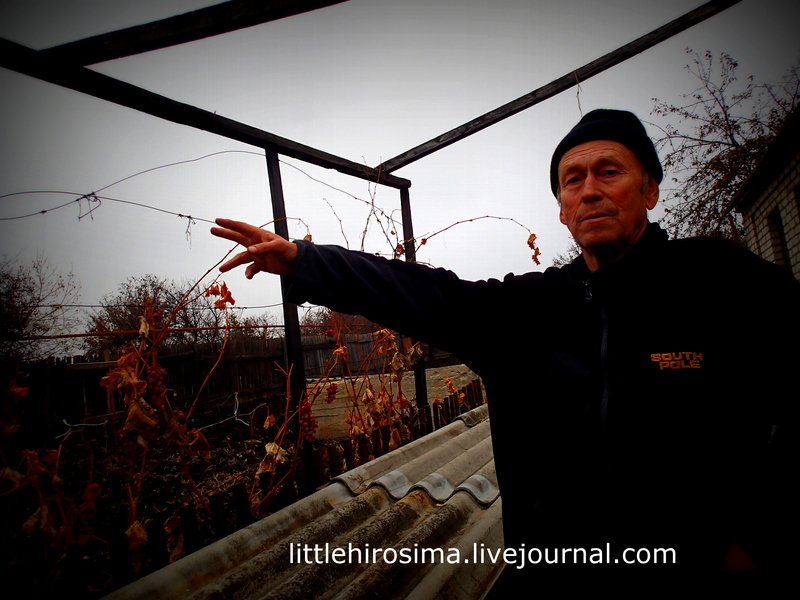 Viktor points, then turns around and points at the rubble. –I go into the garden and seen the main door on the ground. The refrigerator is on the other side of the garden. I look–and I see my headless wife. I look at him. Tears? No, Viktor simply turned away. But no tears. He points at the spot where he found his wife. –There was a pile of rubble next to the house. I found my son under it later. His leg was torn away. It was on the other side. The dog was also killed instantly. Viktor now only has his daughter. She also lives in Pervomaysk. He lives within 4km of the border. On the artillery shell superhighway. –It’s been quiet lately. But in August it was one shell after another. Viktor’s son was 36 years old. The house survived, although it’s pockmarked by fragments. When we left, he didn’t accompany us to the exit. He was simply there, silent. I don’t know how many times he’s had to tell that tale. I don’t know his feelings and amotions. But I know that there was a day and an hour in his life. And on that hour part of that life had ended. And he walks past that spot where his life used to be ever hour, every instant. Life which vanished in an instant. He stood right next to us, but he wasn’t there with us. As if only his outer shell remained. We all stood on that porch, stood there in the place of his loved ones, whom he left behind the gate. Even though I’m writing this, I don’t understand a thing of what I’m writing about. And all of you, reading this, can pour out countless useless and powerless tears and still not understand. You can scream your throat raw over what’s true and what’s untrue. You can shove your demands for videos and proof. Everything. None of us, myself included, don’t understand a damn thing. What it means to see one’s headless wife whom you left grumbling at you five minutes before. None of us, damn it, understand what it means to find one’s son in pieces in a pile of debris.